From destination outback pubs to the invigorating wilds of Tasmania, these winter road trips will help you make the most of the colder months. It’s hard to collate a list of great winter road trips without mentioning The Great Ocean Road. As one of Victoria’s most scenic drives, this iconic route will see you journey through a combination of clifftops, surf beaches and lush rainforest. It’s about 100 kilometres from Melbourne to Torquay, the unofficial start of the Great Ocean Road. From here, continue through a series of quaint coastal towns: Lorne, Anglesea and Apollo Bay are all worthy stops along the way, and don’t forget the obligatory photo opp at the Twelve Apostles, around two thirds through. Port Fairy is the last and most crucial stop along the Great Ocean Road. Once a town of whale-hunters, it’s now a chilled out fishing village with a whole lot of personality. Boasting over 50 buildings classified by the National Trust, and an impressive catalogue of 1800s architecture, winter-goers can explore one of the many attractions. Stroll through neighbourhoods filled with Georgian-style merchant public buildings and homes, or journey along the Port Fairy Maritime and Shipwreck Heritage Walk, learning more about the local history. For a sample of the best food and wine, pop into the renowned Time and Tide Gallery & Tearoom, Merrijig Kitchen or the Limestone Gallery and Café. On-the-road Highlights: Lunch at A La Grecque restaurant in Aireys Inlet, koala spotting in Kennett River, a hike through Great Otway National Park and surfing at world famous Bells Beach. Among the notable beauty of the Cradle Mountain-Lake St Clair National Park sits the unassuming Dove Lake. The wooden boatshed is a sight mainly captured on postcards, however its snow-clad magic is definitely best appreciated in person. If you’re coming from Hobart, the drive to Cradle Mountain will take you around four and a half hours. The trip will show you the best of the Tasmanian countryside, with ample idyllic landscapes to feast your eyes on. Make sure you stop for a pie in Sheffield, and take the time to buy something Twin Peaks-esque in the historic Slaters Country Store. Once you arrive at Dove Lake, you simply cannot leave without completing the circuit walk. At around six kilometres in length, this track will take you around the base of the lake, concluding beneath breathtaking Cradle Mountain. To satisfy your post-hike appetite, locals recommend The Lodge Tavern for a cheap and cheerful pub grub. For wildlife explorers, few towns are as exciting as Albany – aka the whale-watching capital of Australia. Whales can be seen between June and October, with whale-watching posts located around the protected coves. Albany’s whale history can be traced back as far as 1800, when whale poaching was still active. However, commercial whaling was thankfully banned in 1978. To learn more, take some time to visit Whale World, the only museum in the world to be housed in a former working whale station. You can also stretch your legs on one of the incredible coastline walks (Lake Seppings bird walk is great for bird lovers), or stop by Muttonbird Island Nature Reserve. There are plenty more ways to fill your itinerary after you’ve had your wildlife fix. Albany was of the first towns settled by Europeans, after ships full of convicts and soldiers sailed into King George Sound in 1826. A replica of the Brig Amity now stands in the Princess Royal Harbour to acknowledge the town as being one of the oldest in WA. The main reason people travel to the Prairie Hotel, 470 kilometres north of Adelaide, is for the food. If you can kill it, they’ll grill it: kangaroo fillet, camel sausage and emu fillet mignon are piled high on a mound of gravy and mashed potato. The infamous pit stop attracts travellers from far and wide and has won awards for its food, atmosphere and accommodation. The staff say they never know who will pop in – Sir David Attenborough, Kate Winslet and Rachel Ward have all come by for a taste. As for the road trip, the scenery looking out on the Flinders Ranges is equally as impressive as the menu. As winter arrives, the weather is dry and crystal clear, making for perfect driving conditions. The route will pass through the Clare Valley wine region – the perfect time to stretch your legs and enjoy a taste test. If you have more time, take a leisurely walk or cycle along the Riesling Trail. If you’re a history buff, make your next stop Melrose. 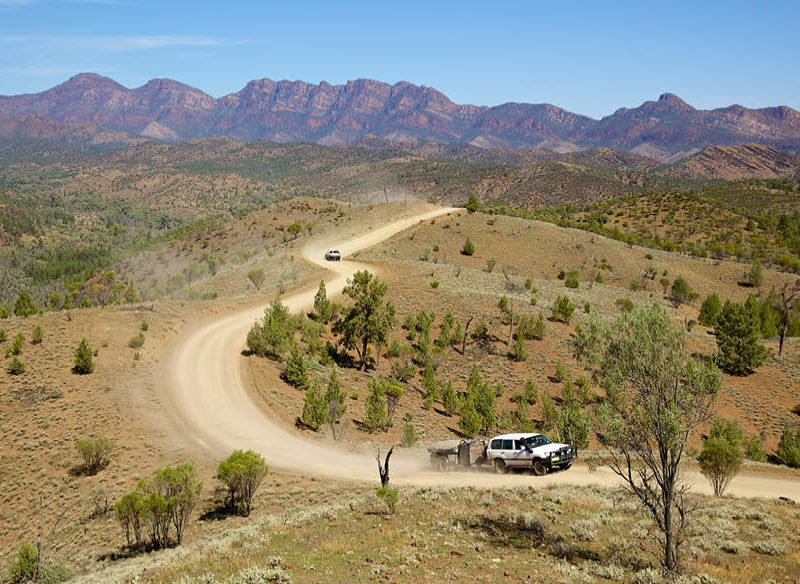 As the oldest town in the Flinders Ranges, it’s home to some of the most iconic South Australian sights. The North Star hotel holds the cellar door for Bundaleer Wines. The hotel is also close to Mount Remarkable National Park walking trails – the perfect place to walk off your ‘feral’ Prairie Hotel lunch. From Adelaide to Alice Springs – the Stuart Highway sets the backdrop for the mother of all road trips. The route was first set by John McDouall Stuart over 150 years ago when he led the first successful expedition across the continent and back again. His journey took nine months north, and another five months back to Adelaide. Your 1533-kilometre journey should hopefully move a little quicker. The trip is given a recommended driving time of 16 hours, featuring at least one overnight stop. In a perfect world however, the drive through the spectacular nothing is done at a leisurely pace, over three or four days. Landscapes are bleak, dirt is red and reception is almost non-existent. It’s the perfect backdrop for personal reflection, granting you complete isolation filled with quirky outback towns, vast horizons and blue skies. Road trip highlights include a dip at the Berry Springs National Park, just 50km south of Darwin, followed by a drink at the Daly Waters Pub, a venue that has been pouring beers since 1893. For fuel, food and accommodation, look out for signs in Port Augusta, Pimba, Glendambo, Erldunda, Coober Pedy, Cadney, Marla, Kulgera, and Stuart’s Well. The Greater Blue Mountains drive is without a doubt one of New South Wales’ most celebrated and exciting journeys. Covering over 1200 kilometres of connecting roads, the main route is filled with epic valleys, historic towns, incredible food, and native wildlife and sandstone cliffs. Everything needed for a perfect wintertime escape. And with over 140 kilometres of walking trails, there is a route suitable for everyone. Grab a coffee and refuel at the laid-back Leura Garage. What was once a mechanic workshop is now a cosy eatery serving stone-baked pizza. For fans of gourmet produce, satisfy your sweet tooth with a trip to Josophan’s Fine Chocolate in Leura, or detour down to Lowes Mount Truffiere to score some of its Black Perigord Truffle. If you have a little time on your hands, Shield’s Orchard in Bilpin will serve you one of its famous ciders, plus as a map to explore its bountiful fruit plains. Or if you’re craving a good drop, Dryridge Estate in the Megalong Valley will be sure to satisfy. If you’re not sure where to stop, it’s good to know the highlights. A short drive through Katoomba will see you through to Echo Point, best known as the viewing point for the famous Three Sisters. Second to the sisters is Scenic World, another of the area’s most visited attractions. This glass-floored gondola offers panoramic views across the famous gorge. You can then hop aboard the steepest scenic railway in the world for a quick cable-car down to Jamison Valley floor, then wander up the 2.5-kilometre foliage-filled boardwalk before hitching a ride back up the slope. While you’re there, visit the Katoomba Waradah Aboriginal Centre to experience an unforgettable dreamtime storytelling session. Then enjoy a walkabout guided adventure through the mountains, taking in the extensive number of sacred sites of the local Darug people. If you’re anything like me, you’ll know that nothing validates a road trip like coming home with some one-of-a-kind purchases. The village of Leura is home to a number of antique stores, as well as vintage and op shops. Further afield, the New Age Markets in Springwood is a must-stop for its array of mystical books, crystals and all-around hippie vibe. If you’re pressed for time but still desperate for a road trip fix, Sydney to Jervis Bay is right up your alley. The journey takes about three hours, taking you along the Grand Pacific Drive, over the Sea Cliff Bridge and through the Royal National Park. Upon your arrival you will be greeted with some of the world’s whitest sands, breathtaking views, clear waters, expansive bushland, and if you’re lucky, some friendly dolphins. If you have time, make sure to stop at the popular coastal village of Kiama – home to the natural Kiama Blowhole phenomena. In the east of Tasmania lies one of the country’s most beautiful short drives. And while any drive through this island will offer you some incredible views, the journey from Launceston to Hobart will also take you through some iconic destinations. There are a number of routes offered for those keen to undertake this drive, all featuring a number of famous stops. The shortest time is 2.5 hours, which takes you the historical way, up the Midland Highway via the convict-era towns of Longford, Campbell Town, Ross and Oatlands. For those keen to detour, Bothwell and the Highland Lakes Road provide an alternative. This route takes you over the Central Plateau, down the escarpment at Poatina. Alternatively, the road continues a little further along the Central Plateau, allowing you to pass the Great Lake. This route takes about 3.5 hours. Home to a couple of hundred penguins (and a couple of Hemsworth brothers), Phillip Island lies just off Australia’s southern coast, about 148 kilometres from Melbourne. The M1 will take you straight there, passing through Cowes and the fishing village of San Remo. Although there are a number of attractions that bring tourists to Phillip Island (a treetop boardwalk, the Grand Prix circuit, the A Maze’N Things theme park) the real drawcard is the world famous Penguin Parade. Taking place on the beautiful Summerland Beach, each night as the sun sets, the resident penguin colony waddles from the choppy waves of the sea to the sand dunes behind the beach. As they make their way home to their burrows for the night, hundreds of onlookers can watch the magic unfold from a viewing platform.